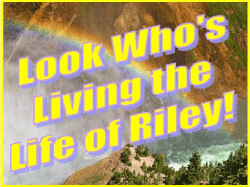 *** WINNERS *** Angela, Wanda, Carmen and Ellen are Living the Life of Riley! CONGRATULATIONS! I want to give a big and hearty CONGRATULATIONS to Angela, the winner of the xZubi Disc 5-Pack! Angela now has 48 hours to confirm! I also want to give a big and hearty CONGRATULATIONS to Wanda, the winner of the BARBAR Italy 3800 Ionic Charger Blow Dryer! Wanda now has 48 hours to confirm! I also want to give a big and hearty CONGRATULATIONS to Carmen, the winner of the Learning Resources Healthy Helpings Game! Carmen now has 48 hours to confirm! I also want to give a big and hearty CONGRATULATIONS to Ellen, the winner of the MPG Sport Performance Top and Bottom of Choice! Ellen now has 48 hours to confirm! *** WINNERS *** Carole, Courtney, Shirley and Sylvia are Living the Life of Riley! CONGRATULATIONS!